Marking the Calendar…Race Time! | Run, Lindsay, Run! I’m indecisive and get bored easily. Especially when I’m not thrilled with my choices in the first place. I’ve been playing around with different WordPress themes, and finally found one I like! What’s even better, I created a fun header (look above)! I read others blogs and envy their design– while I am in no way a professional designer, I played around with Pixlr today and created a more eye-catching header. I recommend Pixlr– it’s like a free web-based version of Photoshop. Let me know what you think! I also added a bit more to the Training tab, including my running log to-date for my next race, the NYC Half-Marathon on 3/20. With just under 6 weeks left till race day, I’m amping up my miles and trying to get in more speed work at goal race-pace. Speaking of races, I added a few more races to my 2011 calendar! I finally caved in and joined NYRR (New York Road Runners) this year as members get reduced entry fees to local races, and I knew it’d be good motivation to hop in some smaller races around the year, rather than focusing on only a spring half-marathon and fall marathon. Here’s what I’ve got planned so far! I miss having a full calendar of races to keep me motivated! Hopefully I’ll add a few more to the roster during the summer and fall. I enjoyed a fantastic long run this past Sunday which boosted my confidence a bit! I decided to run to Central Park, do 2 full loops, and run home for about 14 miles. Halfway into my first loop, I ran into an old friend who ended up joining me for the next 8 miles of my run! He was taking it easy, which really meant I still had to work a bit harder to keep pace and not feel like I was slowing him down! The 8 miles with company absolutely flew by, and it reminded me how much I enjoy running with people rather than solo.Yes, there are always those days (like this morning…) that I love to do my own thing and go at my own pace, my own route, etc. but generally I miss having a team of friends to run and chat with! After he split off, I was left plodding back home with tired legs from the brutal hills on the west side. 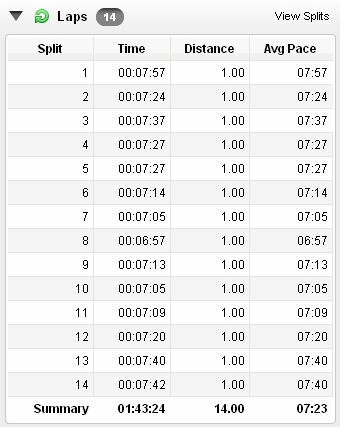 You can see how my pace picks up a tad after he joins me (after mile 4.5) and drops off again after he splits (after 11.5 miles). Since my longest run before this was only 12 miles, I’m feeling good about how it panned out. What races do you have coming up? I love to plan out months in advance so I can train and schedule everything accordingly..I am a planner! Oh, lovely! If I lived in NYC I would def. join that club too. You should come out to SF for the SF half with all of us! Nice job on the long run! The weather on Sunday was perfect and I’m so bummed the cold has returned. I think I need to squeeze in a 14 or 15 miler this weekend – I can’t believe there’s only 6 weeks till the NYC half!! I hope once my training starts again on Saturday that I have the pleasure of bumping into you! I also hope you have my training schedule all prepared. Thanks coach! Red Velvet Love « Run, Lindsay, Run!